Earlier in the week, I wrote about how I used the Sigma 50-500mm to zoom in and save a Reluctant Sunset. I used this lens to zoom in and shoot several sets of HDR. I merged the photos with Photoshop CS5 and then used Topaz Adjust 4 to bring out the details. As a Photoshop user for over 15 years, this is my playground and I want to keep most of the manipulation in Photoshop itself. I created the above photo using the following technique. 1. 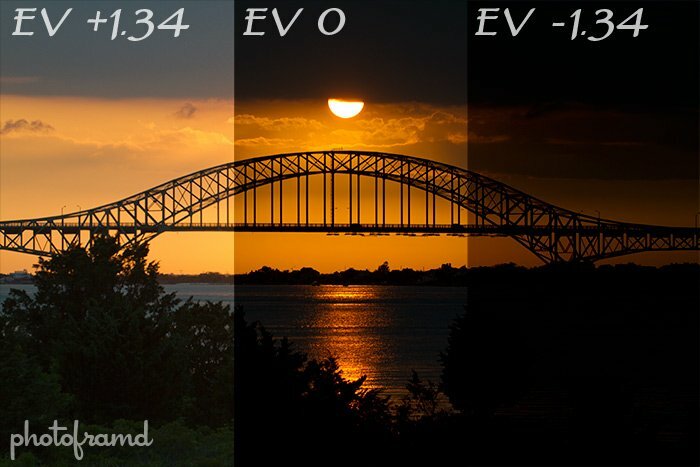 Use Auto Exposure Bracketing to take the HDR series. 2. 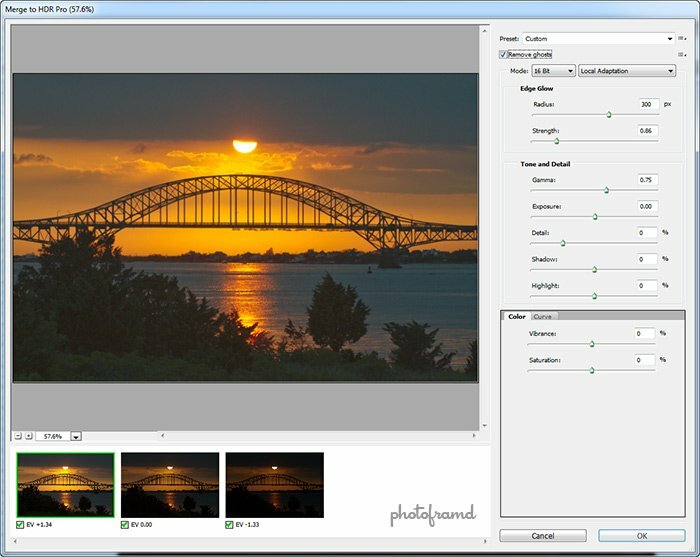 Build the composite in Merge to HDR Pro. 3. Clean up the composite in Topaz DeNoise. Whenever you manipulate an image, you run the risk of exaggerating the digital noise. Even an image shot with ISO100 can suddenly look very noisy after a lot of manipulation! Topaz DeNoise 5 is the best plugin to remove digital noise but retain all the details. It is scary how accurate it is! As with all of the Topaz plugins, you can start with a preset like “RAW – moderate” and then tweak to perfection with the sliders. 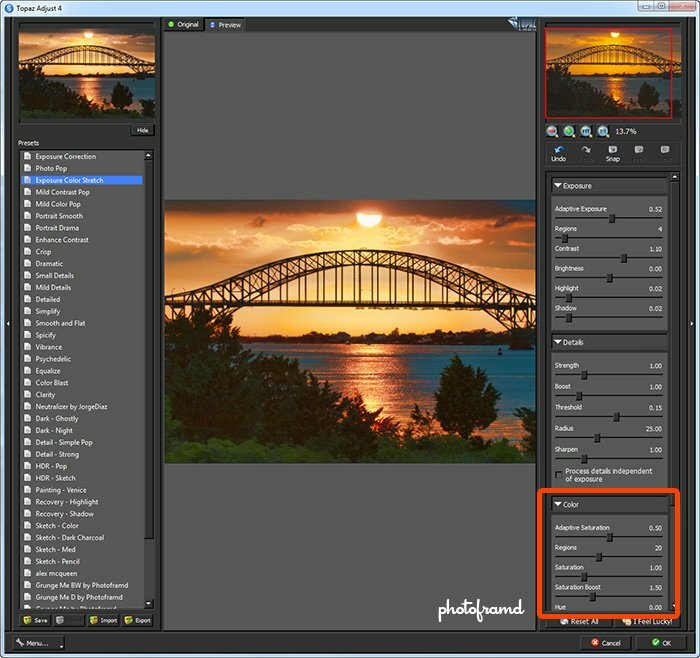 Depending on the image, I usually start with either the Light” or “moderate” preset for RAW images. Since I am planning to layer the effects, I am using Topaz Denoise 5 to create the clean first layer. 4. Pull out the details with Topaz Adjust 4. Topaz Adjust 4 is very powerful and it works directly with 16-bit images! 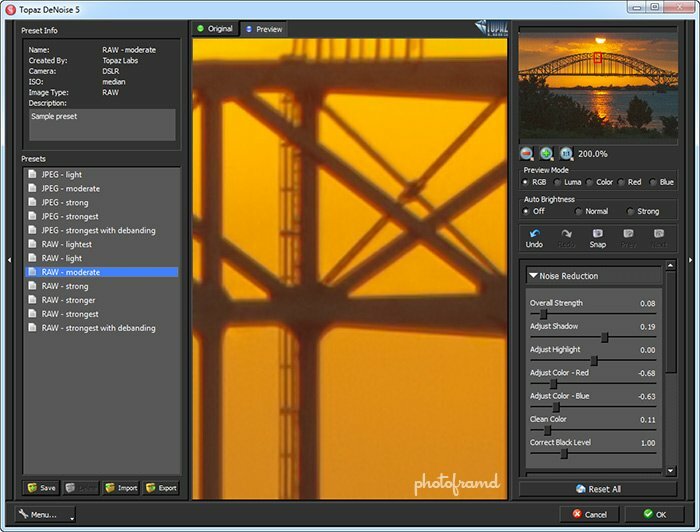 If you want to create that “over-processed” HDR look, Topaz Adjust makes it very easy. 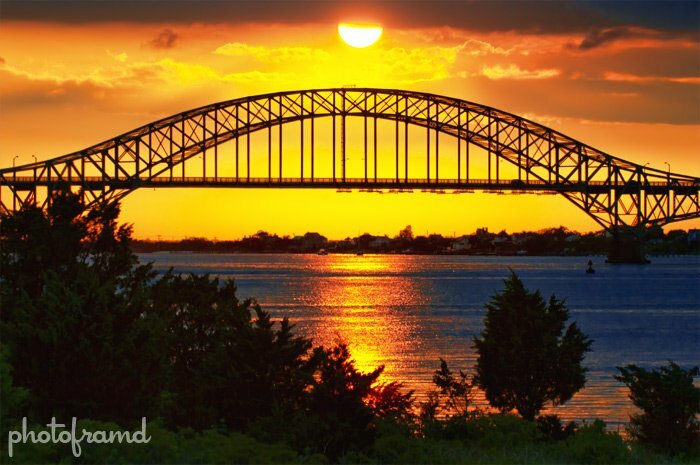 Just use the “HDR – Pop” preset. Personally, I prefer a very natural look which is why I create HDR images this way. My goal is to use Topaz Adjust to enhance the details in the HDR composite. For this image, I started with the “Exposure Color Stretch” preset and then tweaked it further by increasing the Regions, Saturate and Saturation Boost sliders under the Color tab. Don’t worry about it looking to extreme. That’s why I am Layering! Now I start the layering. The base layer is the image that was cleaned-up in DeNoise. The new layer created in Topaz Adjust is on top. The trick is how you blend these layers together. You can experiment with the different blend modes to see which one works best. You can then refine the look even further by decreasing the opacity of the layer. For the above image, I used the “Overlay” mode with 100% Opacity. 6. Use Levels to balance the image. Because I am using Photoshop to create the final image, all the tools that you already know from Photoshop are at your disposal. There is no need to learn a new program and how it handles something like Levels. It’s easier this way. I added a Levels layer and dragged the mid-point to the left to bring out the details in the green scrubs. Remember, this is still a 16-bit image, so all the details are there. 7. Finish by removing cyan from the water. Overall, the composite looks great. But, the water looks a little too cyan. Since this is Photoshop, it’s easy to fix. I added a Hue/Saturation layer, selected the Cyan drop-down and moved the Hue slider to the right to shift the cyan to more of a pleasant deep blue. To make sure the emphasis is on the sunset, I also desaturated and darkened the “former cyan” by shifting the sliders to the left. The final result looks great! 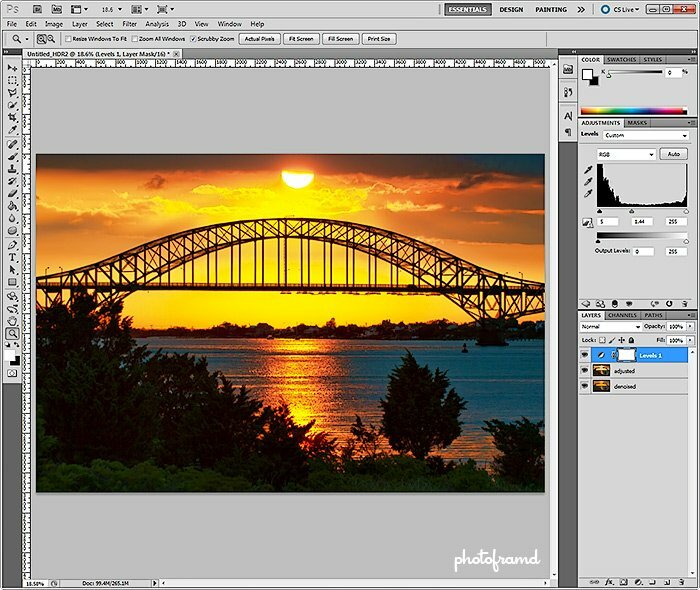 By doing all of the manipulation in Photoshop, you use the tools that you already know to get the results that you want. ← Previous Previous post: Canon 7D Tips – Burned by ebay? Try this for Used Cameras & Lenses! Next → Next post: Canon PIXMA Pro9000 Mark II only $50 at B&H Photo! Slick! A really well crafted image.